Editor's Note: This is the first post in a three-part series from Dave's trip to the Bolivian Salt Flats. 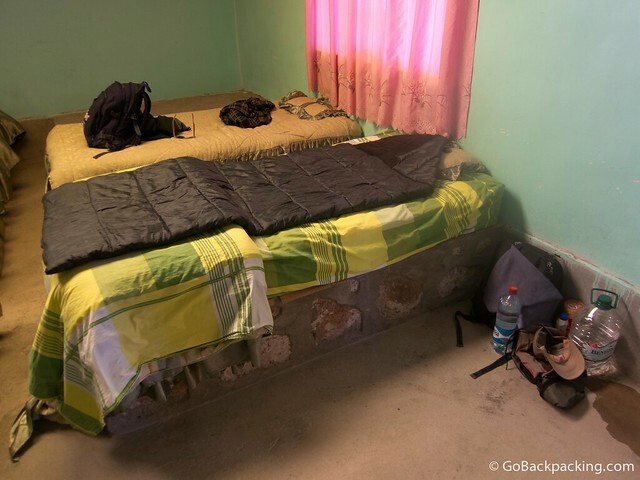 I propped my backpack up against the dusty exterior of Estrella del Sur's tour office, and waited patiently in the early morning cold for my Bolivian adventure to begin. It was 7:30 AM, and the main dirt road in San Pedro de Atacama was still cast in long, dark shadows. Within an hour, a French couple, three young British backpackers and I had been whisked away in a blue and white shuttle bus to the Chilean immigration office. Upon receiving our exit stamps, we returned to the bus, and began the 45 kilometer drive to the Bolivian border. In the hour it took us to reach the Bolivian border at Hito Cajon (4,480m), we'd gradually gained 2,000 meters in elevation. 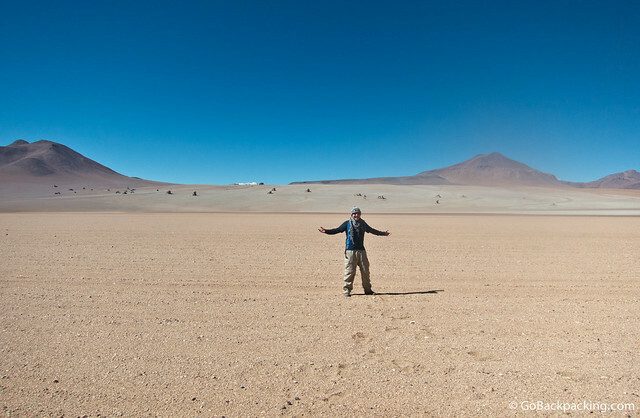 Welcome to the Bolivian Altiplano. Here at 9:30 AM in the middle of nowhere, we first met our driver for the trip. We'll call him Pedro. Unlike most of the other drivers who used Toyota Land Cruisers, Pedro owned a dark green Lexus LX450. It was clearly a source of pride for him, and despite the rough terrain in which it operated on a daily basis, it was clean and well-kept. We were told to take our passports to the small building sporting the red, yellow and green Bolivian flag. It seemed out-of-place in the middle of such a barren landscape. The line wasn't long, but apparently I was the only American, because I was asked to step aside and wait while they wrote down everyone else's information first. 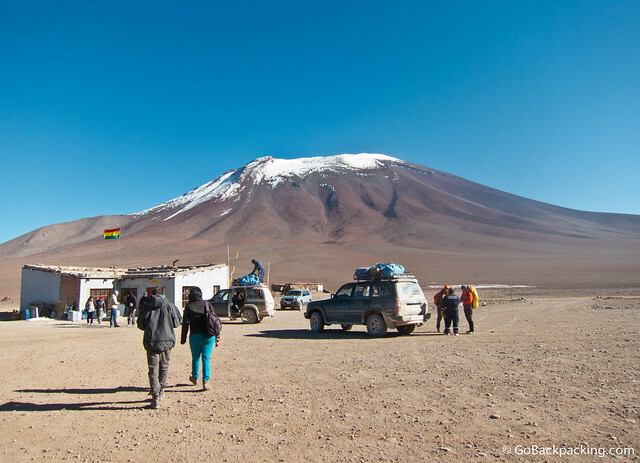 Only then, after everyone else had been recorded, did they inform me that my driver would have to hold my passport until I paid the $135 visa and reciprocity fee in Uyuni. I was annoyed to say the least, having to give up my passport as collateral to a driver I'd only met minutes earlier. This is a detail the guy at the tour agency should've told me about in advance. My passport was sealed in an envelope and given to Pedro, who by then, had finished loading the SUV and wandered over to see what was taking me so long. All the other SUV's heading into Bolivia that day had already packed up their clients and departed. Upon entering Bolivia, you also enter the Eduardo Avaroa Andean Fauna National Reserve and must pay a 150 Bolivianos ($22) park fee. The reserve covers an area of just over 714,000 hectares (1.7 million acres) and is home to all of the lagoons we would see on our first day. Despite the extreme conditions, life exists at these altitudes. Three of the world's six species of flamingos spend time here, as do 77 other species of birds, including the Andean condor. Mammals include Puma, the Andean fox, Viscacha (similar to rabbits), and Vicuña (deer). Less than a half hour from the border crossing is Laguna Blanca (4,350m, “White Lake”) which owes its white hue to the mineral Borax. 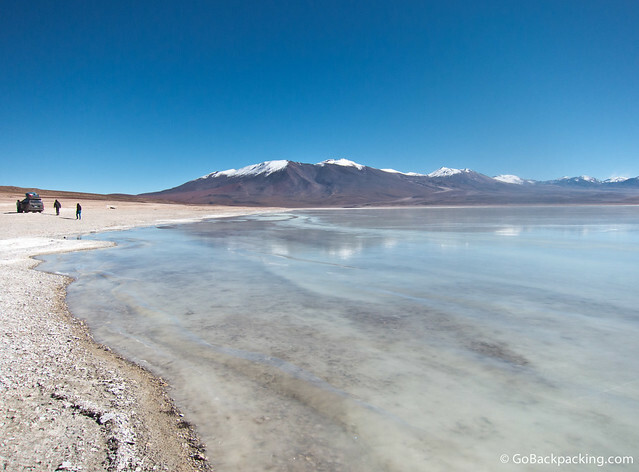 A 30-minute drive from Laguna Blanca is the even more spectacular Laguna Verde (4,400m, “Green Lake”). Here, the turquoise-green color can be attributed to arsenic, lead, copper and other minerals suspended in the water. It's this unique chemical composition that keeps the water from freezing due to the subzero temperatures. Forming a perfect backdrop is the inactive, snow-capped Licancabur Volcano (5,868m). The volcano straddles the Chile-Bolivia border, with the summit and (frozen) crater lake entirely within Chile. It's one of the highest lakes in the world, and archaeological evidence near the top suggest people were climbing it hundreds of years ago for what were surely spiritual reasons. We arrived at Desierto de Salvador Dalí (Salvador Dalí Desert) a few minutes before Noon, after a little under an hour's drive from Laguna Verde. The region is named after the Spanish surrealist painter whose work is reminiscent of such scenery. At 12:30 PM, we'd arrived at Termas de Polques hot springs. 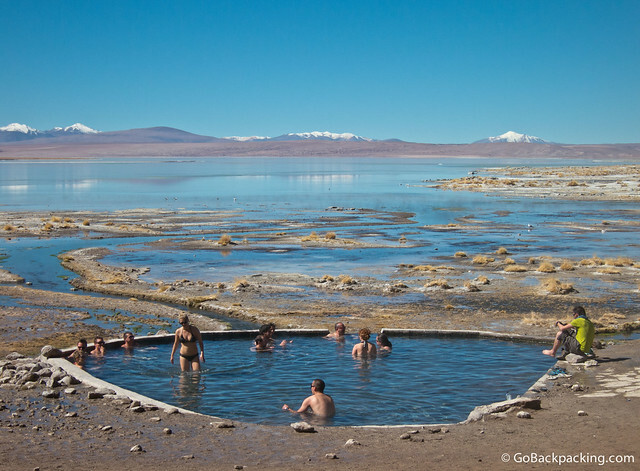 Taking a dip in these minteral-rich waters is a backpacker right of passage for those traveling through South America. The small adjacent building which appeared to house changing rooms or bathrooms was locked, so we each did our best to find an angle allowing some semblance of privacy. For those who prefer not to risk a flash of indecency, there's a shop across the road which charges three Bolivianos ($0.45) to use the restroom. You can also buy snacks like Pringles and bottled water. We had the hot springs to ourselves for the first 10 to 15 minutes, before additional SUV's arrived and unloaded. 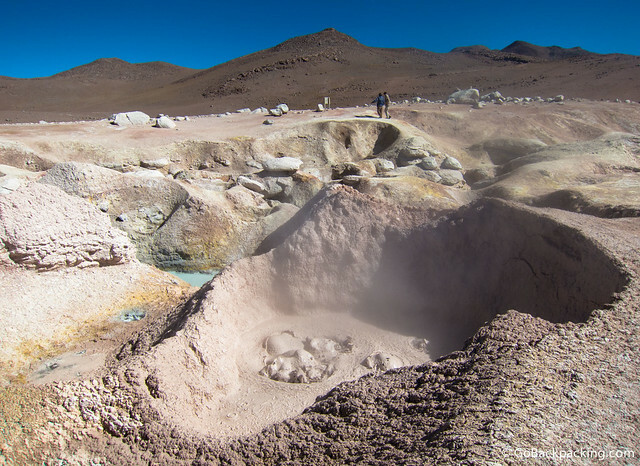 Thirty to forty minutes from the hot springs is the 10 square kilometer Sol de Mañana geothermal field (4,850m “Morning Sun”). These pools of boiling mud present yet another unique and interesting facet of this otherworldly region. The stench of sulfur was so strong in places, I had to cover my nose and mouth to breathe. 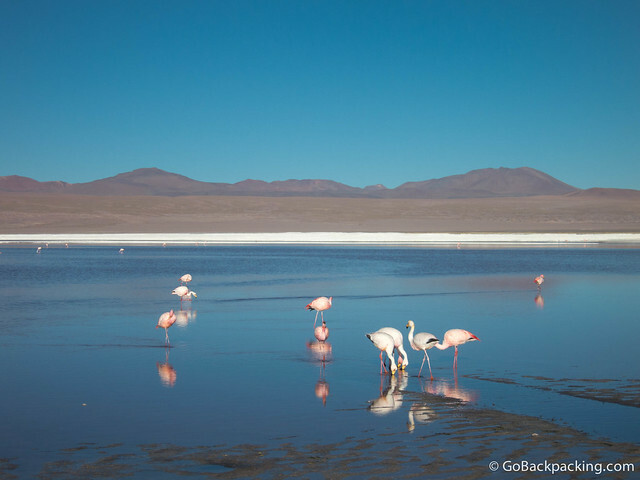 Tours that begin in Uyuni visit Sol de Mañana at sunrise on their third morning, but if you're coming from San Pedro de Atacama, you'll see them in the early afternoon. This suited me fine as I'd already waken up all too early to visit the Tatio Geysers in Chile. After another thirty to forty minutes driving across the vast emptiness, we arrived at our humble accommodations for the night. It was only 2:30 PM, but I'd already seen some of the most fantastic landscapes of my life, and we still had one more lake to visit before sundown. But first, we sat down to a late lunch of hot dogs, mashed potatoes, salad and bananas. It appeared to be an odd combination, but nobody cared. There was always more than enough food at every meal, and the quality of the food seemed to improve with every day of the trip. A little after 4 PM, we took a short drive to the Laguna Colorada (4,278m, “Red Lake”). 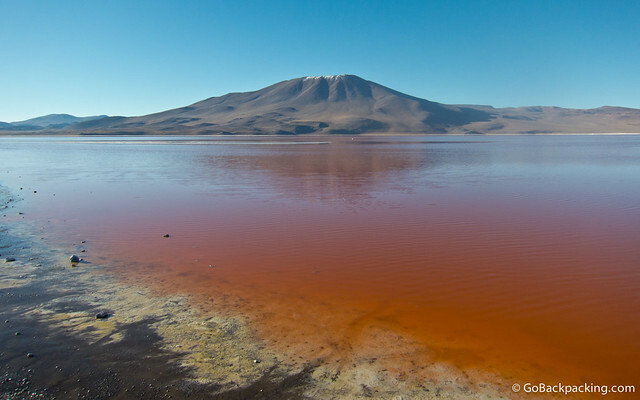 The blood-red color is due to sediments and the pigmentation of algae that grows there. The reddish color provides a sharp contrast to the islands of white Borax. Despite its appearance, the lake is very shallow, with an average depth of only 35 centimeters (14 inches). This is good news for the endangered James's Flamingos, which fly here to feed on the pink algae. While walking around the lake, we also spotted another animal indigenous to the region, the Vicuña. 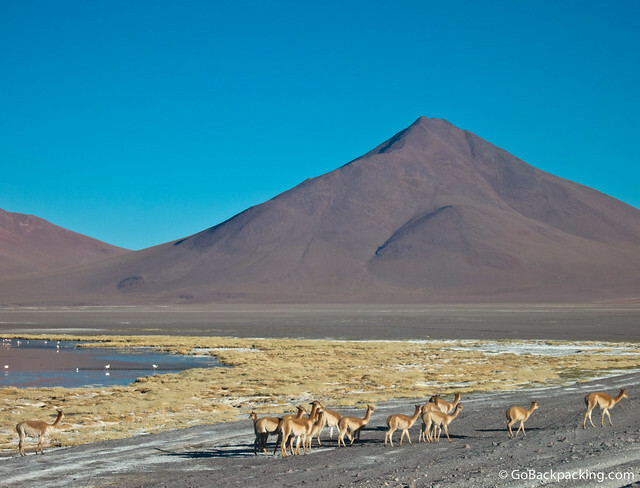 Vicuña are found throughout the Andes at altitudes between 3,200m to 4,800m. According to Wikipedia, the wild population was down to 6,000 animals before they were declared to be endangered in 1974. Since then, they've recovered to a healthier population of 350,000. It amazed me that any animal, whether it be a bird or mammal, could sustain itself off so little vegetation in such a harsh environment. Speaking of harsh environments, the temperatures at these altitudes plummet quickly once the sun goes down. Back at the ranch, we sat down to an early dinner. Soup and spaghetti were served at 5:30 PM, with canned fruit for dessert. All of the food we were eating on the trip was carried with us in the SUV, including the propane tank used to cook it. This particular lodge had a generator which they used for a few hours in the early evening to light the rooms. It also provided electricity for us to be able to recharge camera and phone batteries. 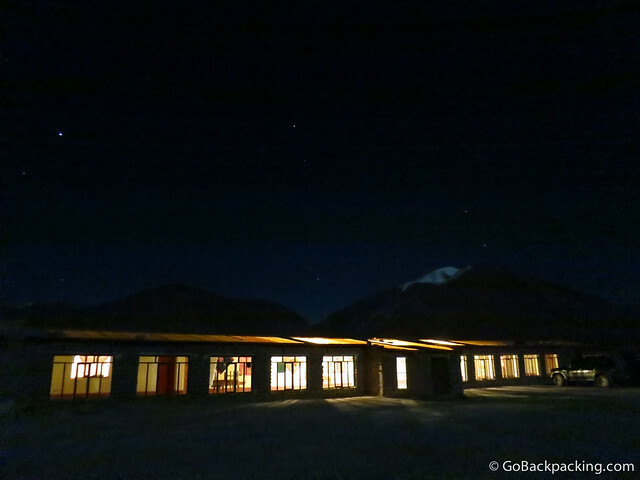 At 7:15 PM, I stepped outside our accommodation, and peered skyward to look at the brightly glowing stars. As my adrenaline from the day wore off, I began to feel the altitude's effects. Even walking a few meters left me short of breath. While I'd trekked as high as 4,500 meters on the way to Machu Picchu the year before, this would be the first time I slept above 4,000m. The trekking rule of thumb for altitudes over 3,000m is to sleep no higher than 300m above where you slept the previous day. Gradual ascents give your body time to acclimatize to the lower oxygen levels in the air. 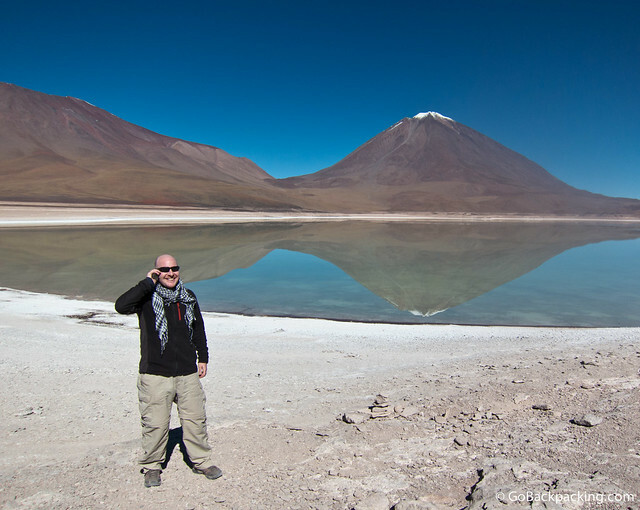 In choosing to begin my tour to Bolivia's Salt Flats from San Pedro de Atacama, I was going from 2,400m one night to 4,280m the next. I knew a change of 1,880m in a single day was going to challenge my body. In addition to the potential for cold, I expected any or all of the classic Acute Mountain Sickness (AMS) symptoms to hit me that night: headache, nausea, lack of appetite, inability to sleep, shortness of breath. Not much latter than 8 PM, I climbed into my rented sleeping bag fully clothed, closed the zipper, and pulled four blankets over me. Putting on my alpaca wool hat completed my cocoon of warmth. But it wasn't the cold temperatures that would wake me up in the middle of the night. Continue reading part two here. I can’t wait to explore South America, look at this hot springs!! I loved reading and looking through this post. This part if the world is my ultimate travel destination and I can’t wait to check it out for myself someday soon. Until the. I will live through you and posts! It must be fascinating to see all those different color lakes. Taking a dip in the hot springs must be a memory of a lifetime. Looking at these pictures I am not surprised that locals in ancient times climbed these mountains as part of a spiritual jurney. Wow, that place is really a breathtaking! I really want to try that hot springs, they said that the hot springs can bring some good effects in our body. Nice blog folks! These photos look amazing! Just followed you on Twitter. Looking forward to connect! Thanks for reading, and the follow on Twitter. Please be sure to use your real name when leaving comments in the future. Thanks!